Sandalford Wines has once again been placed among the best of the Australian wine industry by esteemed wine critic James Halliday. I am very proud to announce we have received a '5 Star' rating and an impressive 10 wines from the Sandalford portfolio were awarded 90 points or more out of a possible 100. The '5 Star' Award is a highly coveted recognition bestowed only on outstanding wineries which regularly produce wines of excellent quality. Halliday is the authority on the Australian wine industry and his opinions are sought on every aspect of the industry. July marked the release of Halliday's best-selling annual Australian Wine Companion (2010 edition), this year including tasting notes for 5884 wines, and profiling 1467 Australian wineries The '5 Star' rating places Sandalford Wines in the top bracket of Australian wineries and the range of wines which received scores in the 'nineties' is further testament to Sandalford's commitment to producing world class wines from the Margaret River region. Founded in 1840 by the State's first Surveyor General, John Septimus Roe, Sandalford Wines is one of Australia's oldest and largest privately owned wineries. Located on the banks of the Swan River in the picturesque Swan Valley, a 25 minute drive from the Perth city centre, this custom built facility offers a unique blend of tradition and innovation, showcasing a total wine experience to visitors, and placing it at the forefront of wine tourism in Australia. Sandalford has also planted vines at it's Margaret River property in 1970 and this is now the main source of it's premium fruit. The 40 year old vines yield grapes of outstanding quality and allow Sandalford to produce wines that are Margaret River's finest. Sandalford's tourism operations and facilities have also been refined over the past 15 years, which has lead to the development and success of this world class establishment. Sandalford has selected the finest wine tourism aspects from around the World, and integrated these features with Sandalford's own unique ideas and concepts into its own tourism Mecca. It's easy to imagine you are in Paris while dining at Mon Ami Gabi at the Paris Resort in Las Vegas that offers al fresco dining on the Strip. The Menu is French and simple and highlighted by classic steak frites and a variety of fruits de mer as well as an extensive wine list. On our visit we met with Sommelier and Fine Wine Representative from Vin Sauvage,Bibiana Escobedo and attended a Mollydooker Wine Dinner she was hosting. Mollydooker wines are legendary . For 12 years, Sarah & Sparky Marquis have been impressing oenophiles around the world with their award-winning Australian wines made for such brands as Fox Creek, Henry's Drive, Parsons Flat, Shirvington, Marquis Philips, Integrity and now Mollydooker. 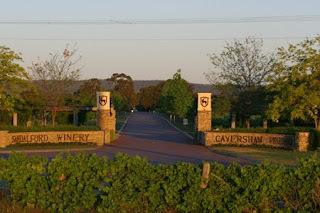 They have been awarded the title of Australian Winemakers of the Year and they are the only husband and wife wine making team to receive Mclaren Vale's prestigious Bushing Award three times; and are responsible for crafting four of only 24 Australian wines to receive 99 points from Robert Parker's The Wine Advocate in the last 10 years. Executive Chef Terry Lynch and Bibiana teamed up and paired many of these wines with a memorable 6 course dinner. Summer wild mushrooms, tiny frisee & Sebastopol apple salad. This lovely beginning with a very well balanced Verdelho and Goat Cheese was just a prelude of what Chef Terry Lynch was about to show us. The peaches with Duck and the Merlot paired excellently as they combined for one of the most interesting pairings of the evening. The Lamb T-Bone with its gamey notes and a the big bold Boxer Shriaz was truly as classic pairing that exploded on our palates. Celery Root , Roasted Shallots , hints of lemon and summer sage. When we saw Ice cream and Cabernet on the menu , we were intrigued with what we thought would be a pairing that we may not enjoy. But , Chef Terry and Bibiana proved us wrong with the peppercorn ice cream combining with the casis of this elegant Cabernet making this dish a real treat and a great way to end the dinner. Executive Chef Terry Lynch and Bibiana combined their expertise to come up with delicious dishes paired with the renowned Mollydooker wines. The staff of Mon Ami Gabi did a world class job putting on the wine dinner for its guests and making it a true culinary event. Join Elaine and Scott of VINO LAS VEGAS as we speak with Executive Chef Terry Lynch , Bibiana Escobedo of Vin Sauvage and enjoy great wines from Mollydooker at Mon Ami Gabi. The menu, created by Executive Chef Kuldeep Singh, embraces the rich culture of Indian cuisine. Voted “Best of Las Vegas” for Indian cuisine and rated “extraordinary” by Zagat. The staff at Origin India to provided us one of Las Vegas’ best dining experiences. 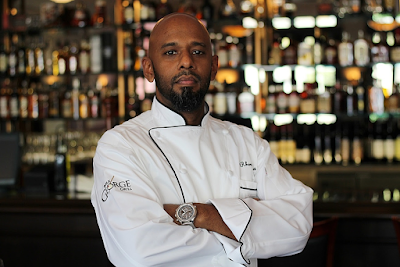 Origin India Restaurant and Bar’s Executive Chef, Kuldeep Singh, is a seasoned kitchen veteran who has extensive experience working for some of the world's finest resorts and restaurants in Ireland, England and India. Born in Meerut, India (about 40 miles northeast of New Delhi), Chef Singh’s expertise does not end with his knowledge of Indian cuisine, but is rather a reflection of his world experience, showcasing Asian-Indian food with a modern and refined flare. Origin India offers a full bar including a selection of signature cocktails created by resident mixologist, Jozef Letasi, that combine premium spirits with fresh fruit, juices and spices that compliment the restaurant’s cuisine. Its wine list includes interesting choices from both the US and abroad while its beer list includes several hard-to-find imports including Piraat, Cantillion Rose de Gambrinus and St. Bernardus. to see Chef Singh at work in his kitchen. From breakfast to late-night, the menu at FIRST Food and Bar features American culinary classics and drinks created by Executive Chef Sam DeMarco. Located in the Palazzo Resort this unique venue has already made a name for it self in short time. Sam DeMarco is no stranger to creating a late-night culinary destination. He put industry dining on the map in the '90s with the opening of First in New York. The restaurant became a mecca for NYC society and famed chefs including Wolfgang Puck and Charlie Trotter. Sam can truly say that he is " a chef's chef "
FIRST has taken it's place in the competitive Las Vegas market with comfort food and one of a kind cocktails for locals and tourists alike. Panevino Ristorante is very distinctive off strip property in Las Vegas. The view of the Las Vegas Strip, framed by slanted window walls, gives its guests a unique view that is not commonly seen. The menu main appeals to those seeking authentic and traditional Italian cuisine served with innovative flavors, presentation and ambiance. Panevino also features an extensive wine list headed up by wine director Rob Horesovsky with varieties from single Italian vineyards to the popular Californian blends. Panevino also features many special events. VINO LAS VEGAS visited on the special occasion of a Row Eleven Wine Dinner. This dinner was different than others we have been to. Not only were Row Eleven wines paired with the dinner but Lisa Rein of Row Eleven Wine company also featured Stratton Lummis and Duckhorn wines as well. Grilled heart of Romain with crispy Prosciutto , roma tomatos and shaved Parmigiano in warm Grogonzola Cheese sauce . in creamy Saffron sauce sprinkled with crispy leeks . Stratton Lummis Chardonnay 2006 paired very well. With no oak , this light colored Chardonnay with aromas of pear , lemon and peach truly complemented the Sea Scallops and Saffron sauce. Creamy Risotto with Porcini Mushrooms and Parmigiano Cheese shavings. Row Eleven Pinot Noir Santa Maria 2006. This pairing was all about earth , earth , earth. The Porcini Mushrooms married with the classic earth aromas of Santa Maria with smoke, spice and cherry to make this pairing our favorate of the night. Stratton Lummis Cabernet Sauvignon braised beef short ribs with mixed vegitables on a bed of mashed potatoes. Stratton Lummis Cabernet Sauvignon 2005. Rich french oak flavors along with tobacco , cassis and violets complemented this classic dish. Warm puff pastry tartlet filled with oven roasted Apples and Goat Cheese with orange sorbet drizzled with Orange Honey. Duckhorn Napa Valley Miel 1991. The Duckhorn Miel pairing with the apples and sorbet was a treat to our palate and a very special as this lovely wine is not made often and is highly sought after. Join VINO LAS VEGAS as we take you inside Panevino and speak with Rob Horesovsky and Lisa Rein about dinner, Panevino and Row Eleven wines. 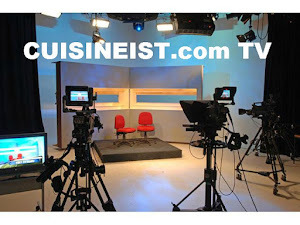 For a very speacial reciepe from Chef Mario at Panevino please visit our premier culinary site at The Cuisineist ! Marche Bacchus has been a favorite of ours for many years. We have spent many weekends enjoying the lakeside view while sharing wonderful wine and conversation with friends. Marche Bacchus is a unique restaurant as it pairs a wine shop with a French bistro both lakeside for a rare waterfront dining experience. New Orleans trained Executive Chef Jean Paul Labadie has done a fantastic job adding his own touch to many well known french dishes. Many Americans dont know what an important event Bastille Day is to the French. It is a French national holiday, celebrated on 14 July each year. In France, it is called Fête Nationale ("National Celebration") in official parlance, or more commonly le quatorze juillet ("14 July"). It commemorates the 1790 Fête de la Fédération, held on the first anniversary of the storming of the Bastille on 14 July 1789; the anniversary of the storming of the Bastille fortress-prison was seen as a symbol of the uprising of the modern nation, and of the reconciliation of all the French inside the constitutional monarchy which preceded the First Republic, during the French Revolution. The parade opens with many cadets from the École Polytechnique, Saint-Cyr, École Navale, and so forth, then other infantry troops, then motorised troops; aviation of the Patrouille de France flies above. In recent times, it has become customary to invite units from France's allies to the parade; in 2004 during the centenary of the Entente Cordiale, British troops (the band of the Royal Marines, the Household Cavalry Mounted Regiment, Grenadier Guards and King's Troop, Royal Horse Artillery) led the Bastille Day parade in Paris for the first time, with the Red Arrows flying overhead. The president used to give an interview to members of the press, discussing the situation of the country, recent events and projects for the future. Nicolas Sarkozy, elected president in 2007, has chosen not to give it. The President also holds a garden party at the Palais de l'Elysée. Article 17 of the Constitution of France gives the President the authority to pardon offenders, and since 1991 the President has pardoned many petty offenders (mainly traffic offences). Owners Jeff and Rhonda Wyatt have turned Marche Bacchus into a comfortable , classy venue where you can enjoy a simple "European" lunch or a classic French dinner under the stars overlooking the lake. When it came to where we should celebrate Bastille Day there really was only one real choice and that was of course Marche Bacchus.